British Prime Minister Theresa May and the British government; EU Chief Brexit negotiator, Michel Barnier and EU leaders. Give a formal guarantee now to all EU citizens currently residing in the UK and all British nationals currently living in the EU, to maintain their existing full rights of residence and work after the UK has formally left the EU. There should be a strong and continuing enforcement mechanism through the courts, a deal of citizens’ rights should be agreed even if the talks on other Brexit issues collapse, and these rights should be guaranteed as quickly as possible during the Brexit negotiations. After months and months of uncertainty and chaos Britain and the rest of the EU are finally about to sit down and start working out a deal. But so far both sides have failed to give certainty to the millions of EU and British citizens that have built homes, careers and lives in the UK or EU. 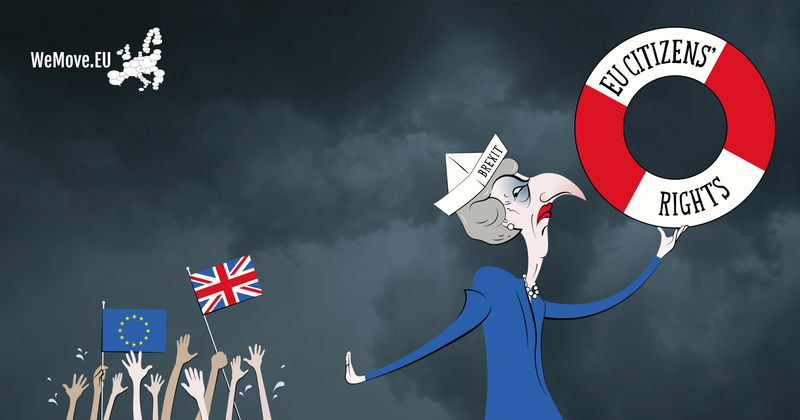 After the recent UK election, Theresa May’s government is weak and unstable. Her own party is divided on Brexit and she is having to re-evaluate her hardline approach to Brexit. This means the British government is vulnerable to pressure. And our community can help force her and her government to stop playing games with people’s lives. The issue of citizens' rights is going to be front and centre in the negotiations. Both sides have said it is a top priority but they are far from in agreement on what that deal will be. The potential impacts of residence or employment rights not being granted are huge. Families could be torn apart, the elderly could be deprived of their pensions, sick people could be denied their health care, workers could be discriminated against. The fact that these potential consequences are so far-reaching and disruptive means that millions of people in the UK and across the EU are already living with huge amounts of stress while the situation remains unresolved. The EU has said it wants to resolve this issue quickly, but seems there are big differences between its position and that of the UK government. EU citizens and UK citizens who live in the UK or EU don’t deserve to be an item somewhere in the negotiating agenda - they deserve immediate action to give their lives the certainty we all take for granted. For too long Brexit has been the abstract plaything of political elites. They’ve been treating ordinary people with contempt and simply as something on their to-do list. Our community will always stand up for ordinary citizens who are facing uncertainty about their future. Now is the time for us to fight for the rights of people who didn’t ask to be put in this awful situation. Because I have relatives in the UK and I want them to be able continue living there. Bad enough that the UK is leaving Europe, without making life hard for our European friends who are already here. The WeMove community is here to stand up to those who would have had their lives thrown into doubt and uncertainty because of Brexit. To stay independent, we are very careful about who we accept money from - but impactful campaigns need funding, so we need your help! Can you donate just a few euros a month to help our community continue working for a fair deal for EU citizens and UK citizens? I stand with EU citizens in UK and UK citizens in EU who face an uncertain future because of Brexit. Guarantee their rights now!